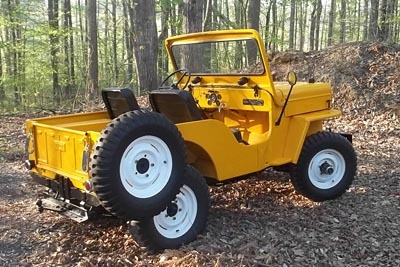 Many of the CJ-3Bs I've run across which are painted yellow, are Jeeps which have been built up enough that they would certainly get more than a second glance anyway. So the bright yellow paint, making them stand out from the crowd even more, seems absolutely right. Then I also remembered this 3B which appears in Jeep CJ-3Bs on Film: The Rubicon Trail, 1955, from the year in which Transport Yellow was introduced as a Willys paint color. In 2016 this 1956 CJ-3B turned up in Mexico in Transport Yellow. 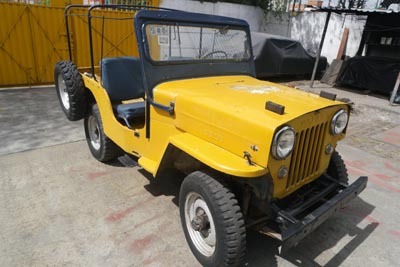 Christián Podlesker bought this Jeep in 2016 in Guadalajara, where it belonged to the Ministry of Health until 1976. He says it appears to have been repainted at some point, but in the original color. 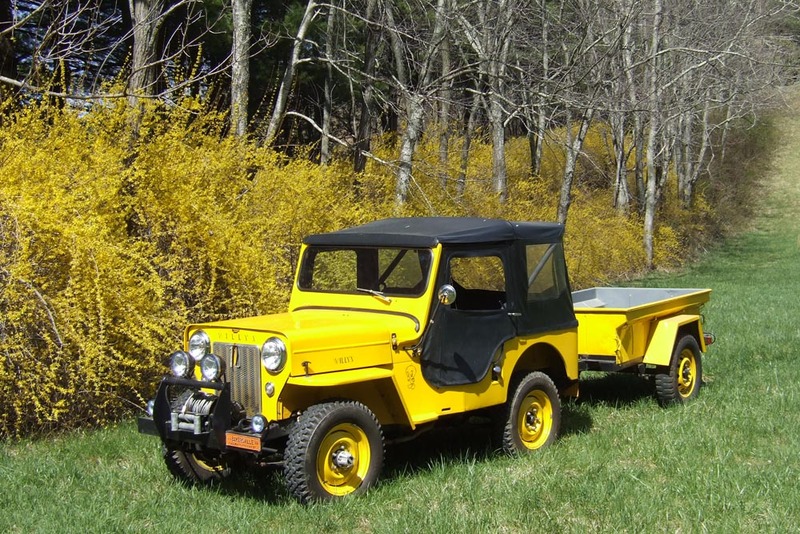 See more details in 1956 CJ-3B Owners and Photos. This Ansul dry chemical crash truck, on the other hand, was painted several different colors over its lifetime. 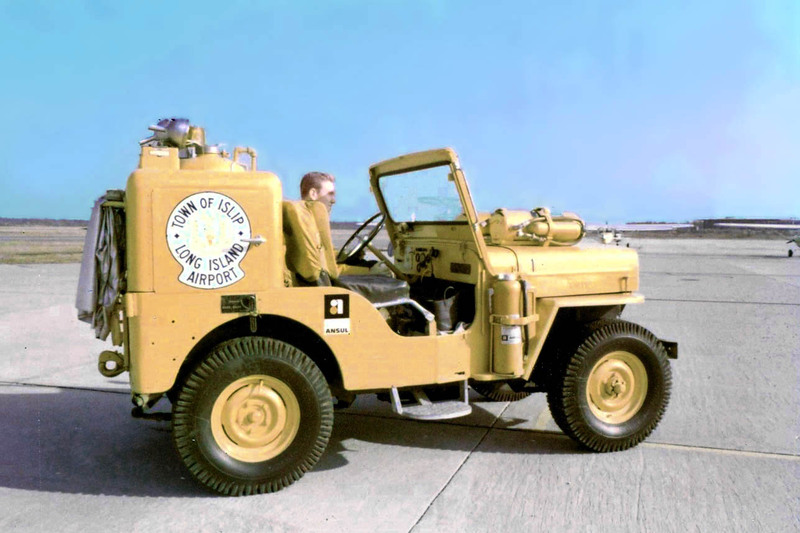 The '53 CJ-3B started out in Woodstock Green, but was painted red and then later yellow for service at Islip MacArthur Airport on Long Island NY. 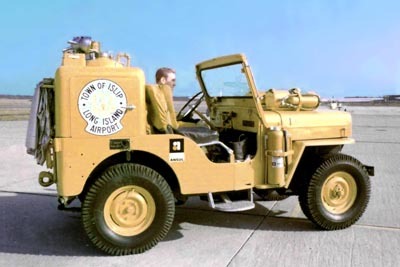 See Ansul Chemical Crash Trucks in the "Fire Service Jeeps" section of CJ3B.info, for more photos. 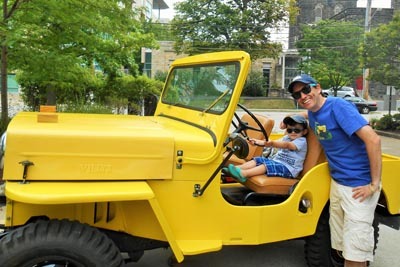 Yellow Jeeps seem to show up in clusters, and these new photos all arrived in summer 2016. 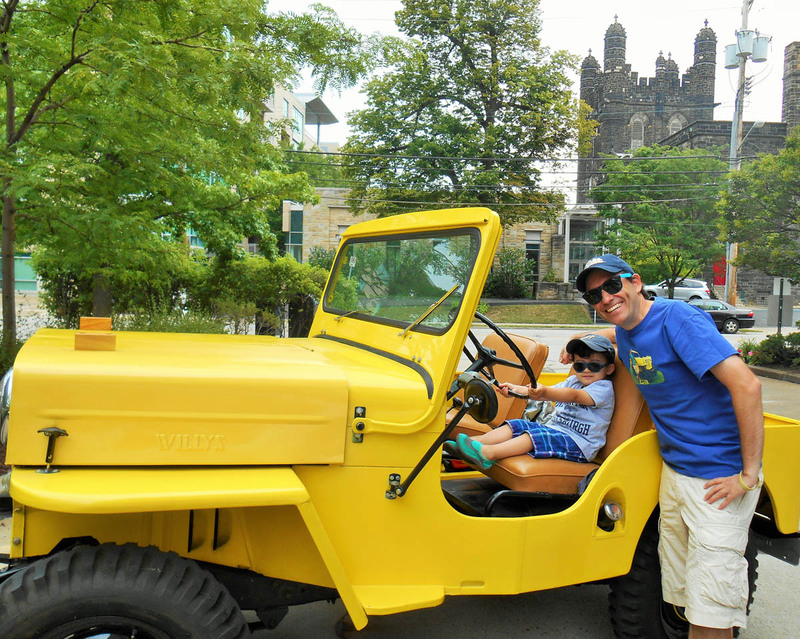 Sebastian in Pittsburgh wrote, "Due to my new responsibilities as a dad, I have not had a chance to get my 1953 3B going this year. Finally after 6 months I started the yellow 3B. Obviously I had all kinds of trouble because the battery was dead and everything dripped! But at the end of the day it was running again like new, so this picture with my son Santi was the cherry on top! 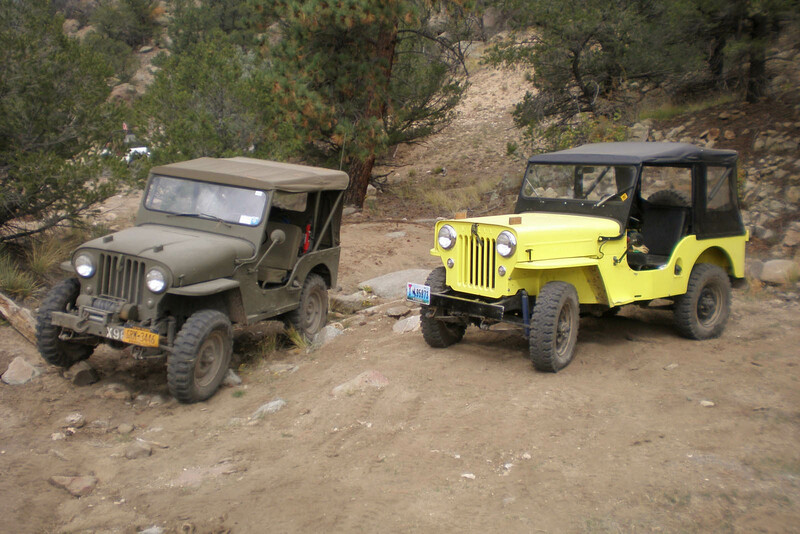 Two CJ-3Bs on the "Chinaman Gulch" Trail during the 2016 Colorado Fall Colors Tour. On the left is Bob Westerman's X98 clone, and the yellow one belonging to Keith Crimm is new to me. 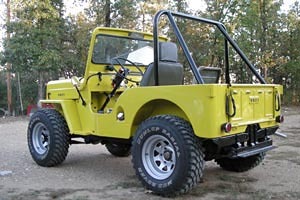 See some new photos added to CJ-3B Rock Crawlers. 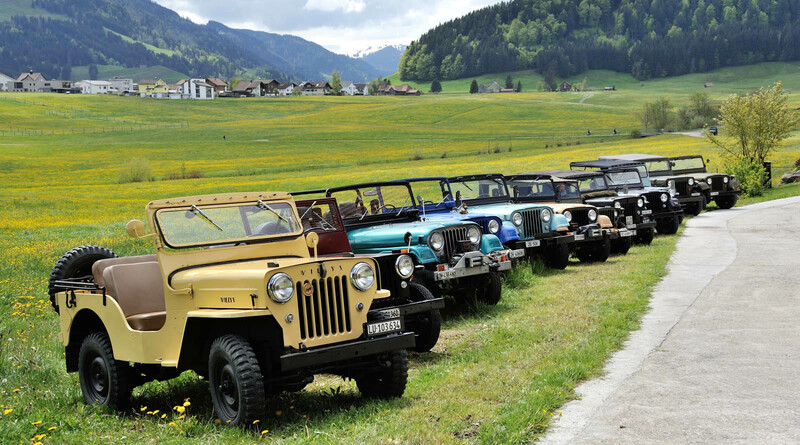 Johannes Tanner just sent a great shot of his yellow '61 from the annual Jeep Meet of the "Absarokee" Jeep-Club in Einsiedeln, Switzerland in 2014. 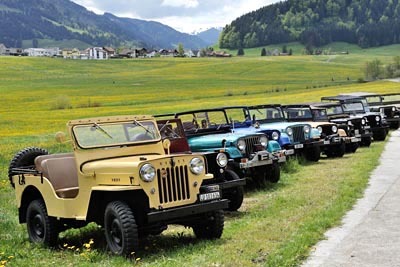 See more photos of his Jeep in action in Jeep Touring in the Alps, including a 2007 CJ3B.info cover photo. Bob Christy spotted "Thumper" in 2017, in Season 7 of the TV show Portlandia , shot in Portland, Oregon. 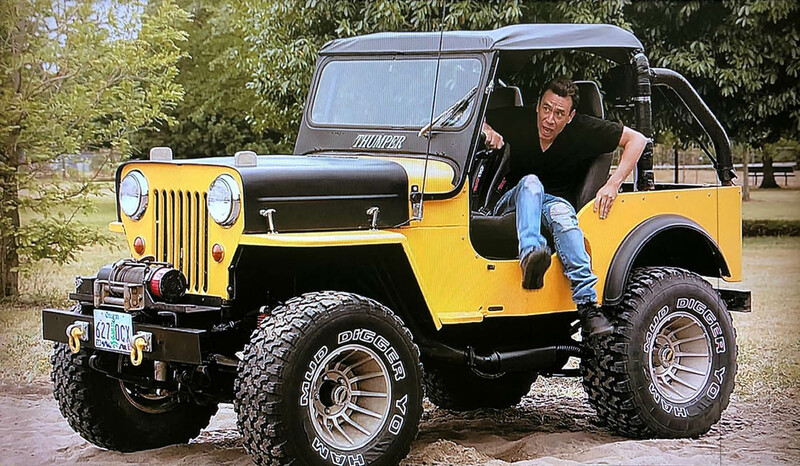 No word on who owns this Jeep. Click on any of the photos below, to jump to the places in CJ3B.info where you'll find more photos and details on these built-up Jeeps. Because he's a Caterpillar mechanic, Brian Greif painted his 3B (above right) in Caterpillar Yellow. 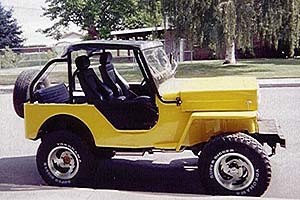 A long long time ago I saw what appeared to be a cloned pair of original "Transport Yellow" jeeps. These appeared to me without warning. An instantaneous incarnation. Like a phantom however, I have no physical proof. Only a vision of what was. 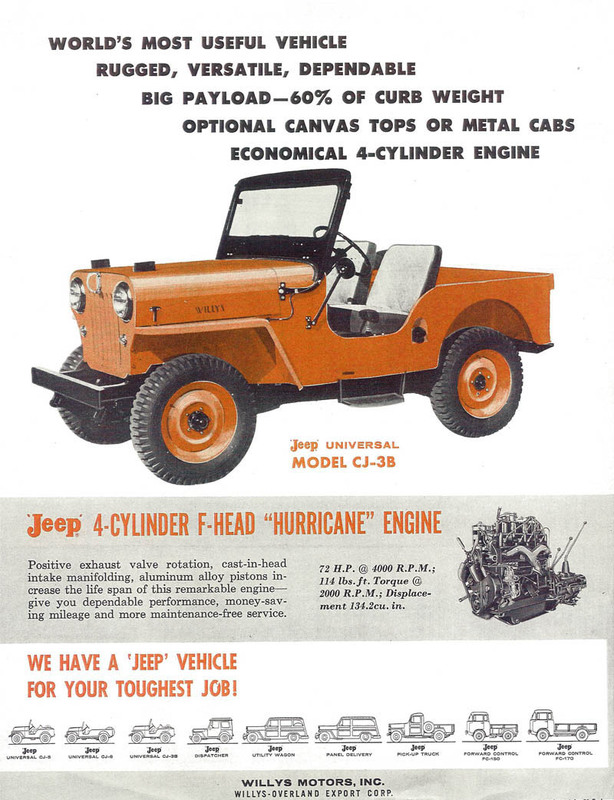 These two jeeps both model CJ-3B, caught my eye many years ago on what could have been a cloudy and rainy evening. That bright color readily grabs at ones attention. And my attention is easily swayed by the presence of another CJ-3B spirit. They sat motionless side by side upon a large industrial parking lot awaiting their resurgence back to life. Parked dead in the middle of this large lot sitting much like gravestones in a graveyard. I dared not to approach them closely. They were guarded by the chains of a cold steel fence. Yes they sat upon a lot owned by Union Electric Company. This did not occur in Salem Massachusetts. <>p>Both jeeps were burdened with grotesquely large snow plows. These forlorn jeeps were overly well rusted. Salt was the demon. 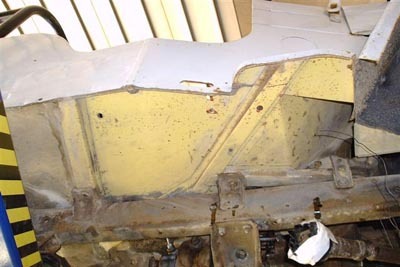 The leaf spring packs were swolen thick with a sickening rust. Large parts of their bodies were missing. The bodies looked as though they were ready for the grave. They were however patched up with fiberglass, and of course retouched with that pumpkin orange paint. Half cabs they were. Eager for cold chilling winds to blow. I carefully summon up a spirit concerning the demise of the Jeeps. I did not however pursue the resurrection of these old decrepid machines. There are some things better left alone. And now for the theory concerning the rarity of "Transport Yellow" paint: Let me say... There are some things better left alone ! In truth the two 3B's revealed in this story were a bright yellow color seemingly without orange tint. However I've seen no record of unadulterated yellow pigment for a 3B paint code. So the mystery of these bright yellow apparitions still haunts me to date. 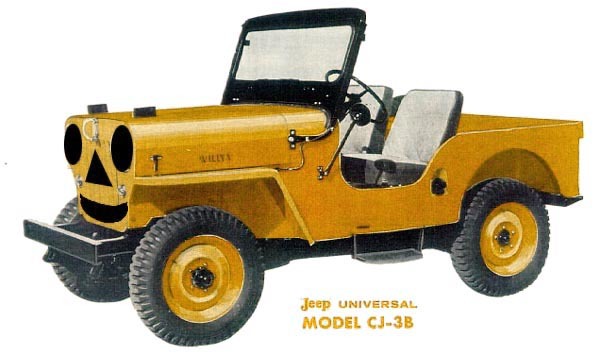 One edition of a 1950s brochure (130K JPEG) shows the CJ-3B in Transport Yellow, suggesting that Willys thought the color would be popular, but there aren't many surviving examples. 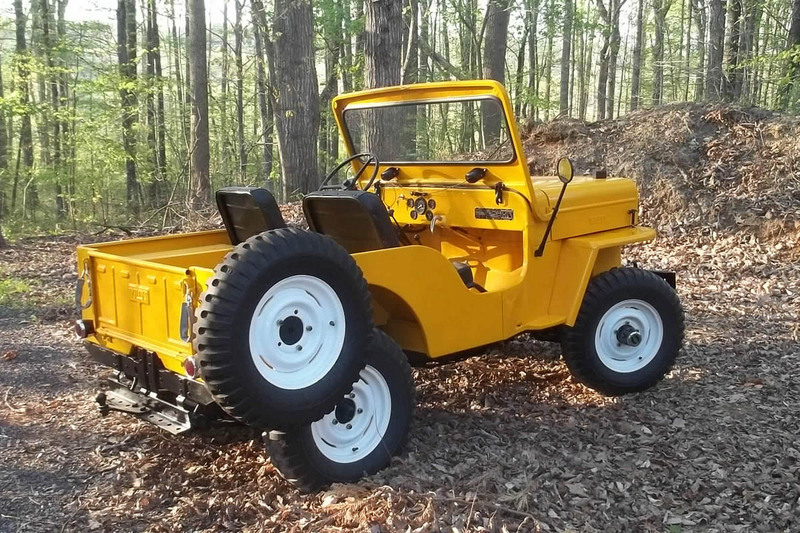 A 1961 model appears to have been custom-painted yellow originally, for a trenching company in New Zealand. 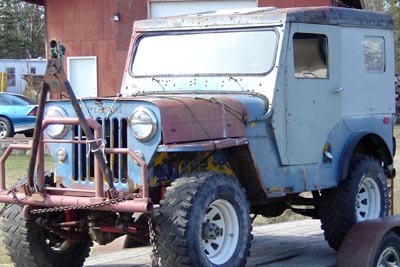 Mark Dunlap found a 1955 CJ-3B in Alaska which had Transport Yellow under later blue paint. Mark painted it blue again when he restored it (see 1955 Owners and Photos) but says, "I have no doubt about it being Transport Yellow originally." A 2013 cover photo (right) was Galen Brown's '54 (280K JPEG) in Virginia, painted Transport Yellow with NAPA acrylic enamel. Craig Godfrey's '53 (115K JPEG) was on the cover page in 2003, before he painted it green. Ed Wilson's '54 (270K JPEG) was a cover photo in 2009 -- see No Spring Chicken. Richard Imholt's Bad Bee (180K JPEG) was on the cover in 2005 -- see Radical 3B's on the Rocks.